The Garden Master CD is a wonderful tool that helps everyone, from novice to expert, plan, design, and calendar their own vegetable gardens – and then teach and help others to do the same! And we are THRILLED to announce that the software DOES work on the newest Windows 10 operating systems, so if you want a terrific bargain and you have Windows 10 OR XP or older systems this is for you! 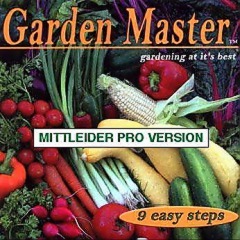 Also included on the CD are Nine Mittleider Gardening Manuals to teach you important gardening subjects such as composting, manures and other fertilizers, the importance and function of soils, and the seldom understood but all-important osmosis and salinity. The Gardening Course book is an older version, but just call and we’ll send you the latest full-color 2017 publication as a digital download. Get $50 of digital books & Manuals PLUS the training and the Wizard, with details covered nowhere else.